Saute minced meat and onion in skillet for 5 minutes. Place mashed potatoes in a large bowl.Combine salt, ground pepper,cooked minced meat, diced button mushrooms and spring onions together, mix well. Shape potatoes mixture into small balls, slightly press the potatoe balls into a cylinder or disk shape. If the potatoes are too soft, place the shaped potatoes into fridge for 30 minutes or longer. Roll shaped potato balls onto rice flour, then dip into egg mixture before coating with breadcrumbs. Prepare fryer or deep skillet at medium heat with oil. Place the coated croquettes into the hot oil. 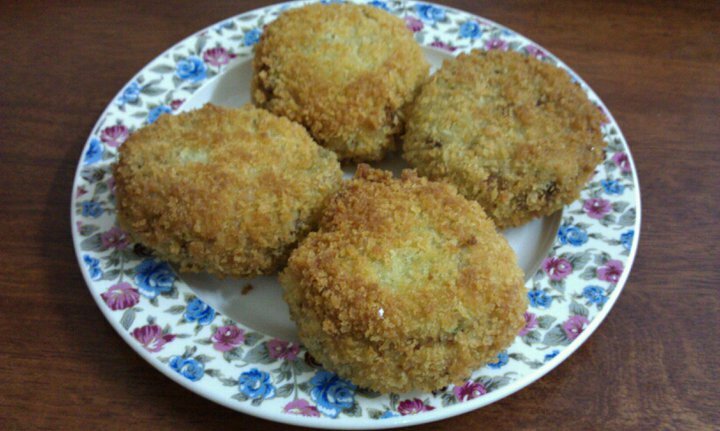 Fry croquette both side until golden brown. Remove the fried croquettes from fryer and place on kitchen towel to drain off the excess oil. Serve warm as snack or with meal.